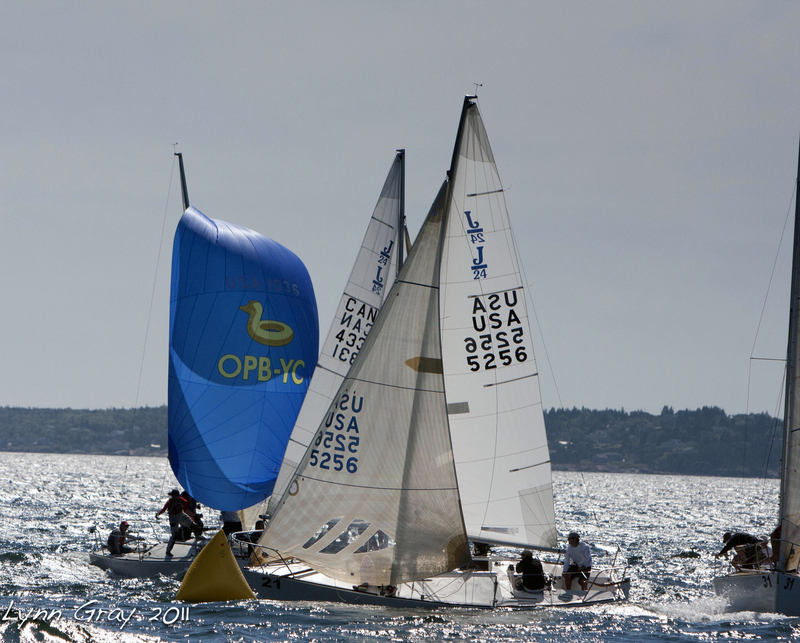 HALIFAX – The final day of the North American Championship again brought shifty light winds that tested the ability of all sailors to be consistent. It was probably even tougher than Friday, as a matter of fact. 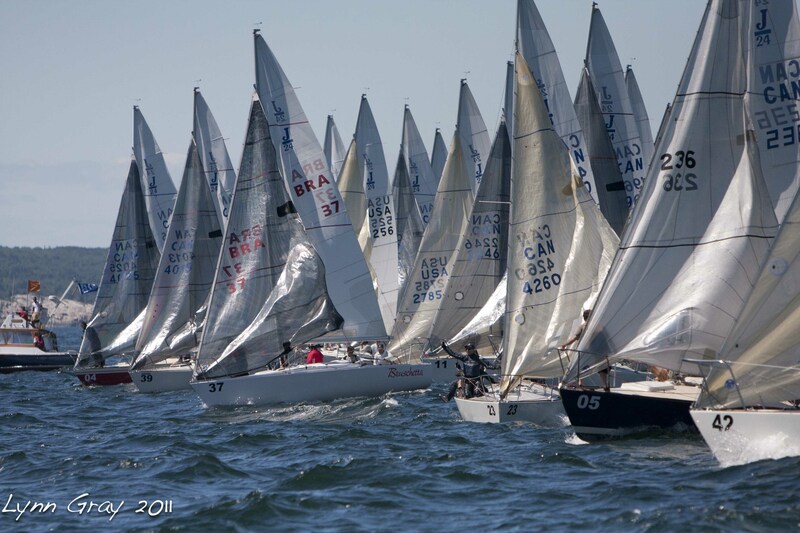 Once again new boats made appearances at the head of the fleet and the sailors who dominated previously struggled to figure out what was going on. The strongest performer of the day was Travis Odenbach in Waterline Systems, who won the first race playing what appeared to me from my position on the sideline as one of two boats that didn’t make the first race start to be a strong lefthand shift as the wind moved from the west to the south. He was followed by Chris Jankowski in Street Legal and Will Welles in Carolina Girl. The second race was a bit more complex as good shifts were identifiable to both the left and the right. I can`t provide too many details on this one because the Stix and Stones crew actually sailed and after rounding the windward mark roughly mid-fleet managed to pull up our spinnaker on the inside of our genoa, which gave us a very good look at the bottom end of the fleet a very distant view of the front. I did, however, see the Craig Noakes & Ian Dawson partnership in Lightning McQueen round the windward mark in first after, I believe, working the right. I also know Ted Bartlewski and crew in Drivers Wanted followed at that point in one of the first mark roundings at which two Canadian boats held the top two spots. They apparently held on through the balance of the race followed by Will Welles, who nabbed his second third of the day. I can give a lot more detail on the final race of the day and the regatta. As I’ve mentioned, my skipper, Erik Koppernaes is a dyed in the wool contrarian. For the third race the bulk of the fleet (i.e., about 25 of 30) lit out for the left side no doubt considering the forecast that the wind would back. We, on the other hand, started by the Committee boat and quickly tacked with a small apology onto our friend Greg Blunden with whom we set out to the west with a couple of other stragglers. As it turned out, Erik was onto something as we watched the boats to the east fade and stall, as we picked up with Greg tucked below us. After Greg tacked to starboard, we waited a bit and tacked ourselves, skipping along just below the starboard tack layline with the entire fleet framed in our genoa window. We rounded the windward mark in first with Greg on our tail and a good lead over the rest of the fleet. Our boat however is slow. Its a cottage boat that should be sold to a good family on Grand Lake so they can race it against the Tanzer 22s up there (it is minimum weight and it has good sails but the bottom needs serious work to avoid being put out to pasture - Ed.). Our crew work also isn`t that smooth. It didn`t take Greg long to catch us after he executed a good gybe set at the offset. We were happy enough to settle for second through the gate in any case. In character, we went left after heading upwind while Greg again went right. We needed to clear our air but Erik also thought it was swinging east and his calculation didn`t appear to be wrong. 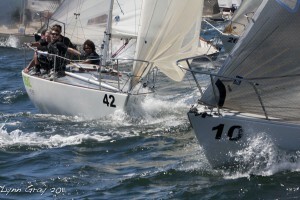 There was good wind all the way, although Greg`s boat, Adrenaline Rush, did pull away on the right. As I mentioned, our boat is slow and we didn`t consider it to be any shame to lose one place upwind to Travis Odenbach. 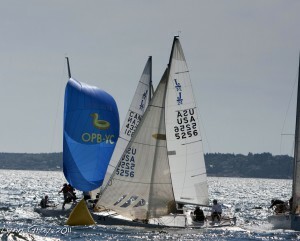 The three of us held on downwind but wouldn`t you know the last race each day has five legs. The boat in fourth place as we headed upwind to the right was Will Welles who already had two threes on the day and appeared to have a strong interest in getting another. He worked us up the righthand side of the last windward leg as Adrenaline Rush sailed conservatively and very well to stay between Waterline Systems and the finish line. Greg ultimately finished with a comfortable lead over Travis Odenbach but Will Wells was more than we could handle, beating us with a lovely roll tack to the finish for his third consecutive third on the third day. From the bigger and admittedly more relevant perspective of the overall regatta results, Odenbach’s pass on us to get into second was critical. The leader going into the last race was John Mollicone, who I have been identifying for two days as Tim Healy for the simple reason that Mr. Healy was the name on the registration form. Whether Mr. Mollicone or Mr. Healy is the current World Champion, I’m not clear, but their boat 11th Hour Racing is damned fast and they held a good lead going into the last day thanks to consistent sailing over the first two days as they managed to be in the top three in all six races. Day three was, however, a bit rougher as they led off with a twelfth. A sixth in the final race, however, appeared to put them in the driver’s seat as they went into the last race needing only a ninth to retain the lead over Odenbach, who was the only boat within range of them. Unfortunately, as so often seems to happen, what had to happen was exactly what transpired. The 11th Hour team finished in eleventh with Carter While in AL and Chris Jankowski in Street Legal respectively occupying the ninth and tenth places that Mollicone needed to overtake Odenbach. I have no idea how close they all were but Ì’m guessing there wasn’t a lot of distance between them. The results are preliminary as I`m wirting but first day leaders Mauricio Santa Cruz in Bruschetta held on for third through a tie breaker over Will Welles. The top Canadian was Ted Bartlewski in Drivers Wanted, who took fifth. 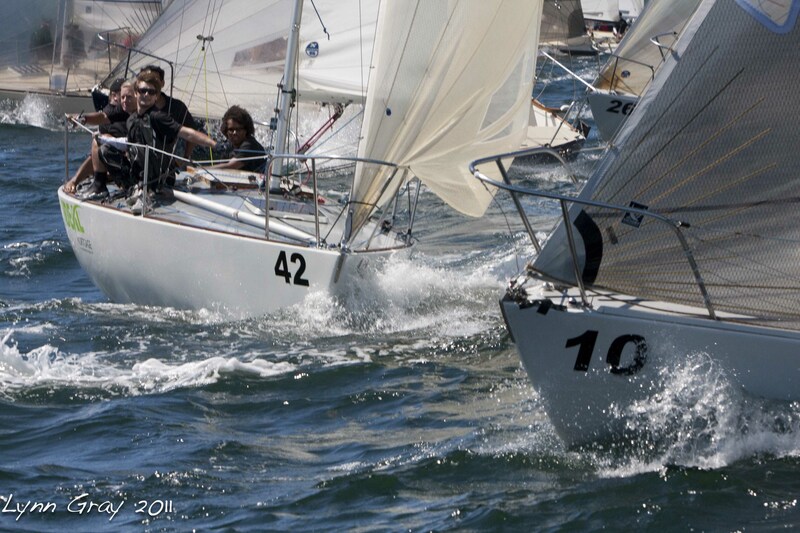 Top Atlantic Canadian was Johnny Whynacht, who brought the crew of Sticky Fingers home in seventh. 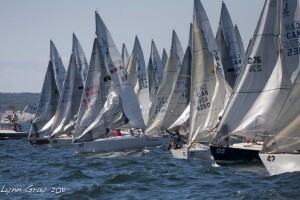 See our Results page for the complete official results of the regatta.